Mumbai city is set to launch an Intelligent Transportation System that involves smart card-based access for passengers and ticket vending machines. 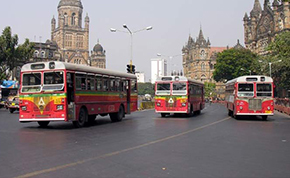 The Brihanmumbai Electric Supply and Transport (BEST) undertaking will procure 50 air-conditioned mini-buses with a capacity of 29 (22 seats and seven slots for standing passengers) each. The vehicles will be taken on a wet lease and specific routes will be chalked out for them. The buses would be fitted with a technology to validate electronic wallets, passes or RFID (Radio-Frequency Identification) cards. Alongside the non-AC and other regular Volvo buses that BEST plans to procure on wet lease, BEST will also introduce a proposal to procure buses with such new technology. They will be equipped with ITS, that specifically eliminates the need for conductors to issue tickets to passengers.